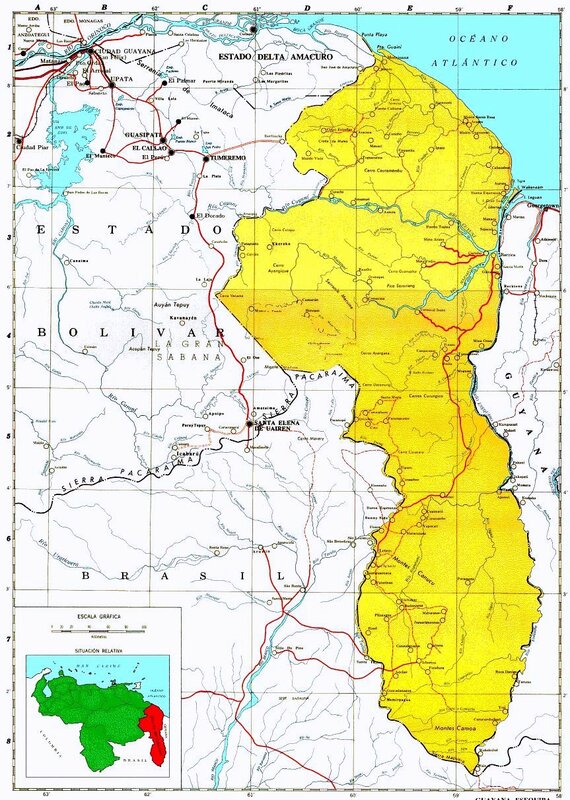 For generations, all maps of Venezuela have included the term “Area in Contention” (Zona en Reclamacion) to highlight the Guayana Esequiba, currently administered by our neighbor to the East, the Co-operative Republic of Guyana. It is the largest part of what they say is their territory. Instead, our maps are the only exception to the rule, which sees “el Esequibo” as Guyanese. The story of Venezuela’s beef with Guyana goes back to the XIXth Century, but the pivotal moment was a arbitration ruling that did not go our way. In February of 1966, months before the United Kingdom granted Guyana its independence, the governments of the UK, British Guyana (before it became the CRG) and Venezuela signed the Treaty of Geneva, in which the three parts agreed to find “a practical and satisfactory solution” to the dispute. Days ago, during the formal unveiling of a 45-million dollar deal between the Guyanese government and the Brazilian consortium Quieroz Galvao for a feasibility study of a hydroelectrical plant in the area, Guyana’s Foreign Minister Carolyn Rodrigues-Birkett declared to local news agency GINA that “…while she cannot predict the future, she does not foresee any issues developing with the neighbouring nation since the area is no longer regarded as “disputed”. There has been no official response to Rodrigues-Birkett’s statement either by the Venezuelan Foreign Affairs Ministry (MPPRE) or by any other government official. Even if Foreign Affairs Minister Elias Jaua travelled weeks ago to Georgetown, it looks like the issue wasn’t in the agenda at all. Still, both governments are formally in talks regarding their border disputes. But why such a relaxed attitude to all this? Well, the possible answer to this question came almost at the same time: last month, the Guyanese government agreed to sell 200,000 to 250,000 tons of rice to Venezuela in the next few months as part of the PetroCaribe deal. For local rice producers, this agreement is very, very important. After all, rice is one of Guyana’s biggest exports. And guess what? One week earlier, Guyana was one of the 22 countries which voted in the OAS against allowing opposition deputy Maria Corina Machado to speak publicly. Just like the case of Jamaica, Guyana depends mightily on PetroCaribe, and in exchange for having the government’s diplomatic back, they not only get cheap oil, but also some of their goods have a viable market. As a bonus, Guyana now has the chance of settling a historical and strategic border dispute in a deadly quiet fashion. As an addendum, this also confirms that “food soverignty” is a mere formality: It was last year and continues to be today.